Movie Ramble: Miracle on 34th Street 1947. Miracle on 34th Street 1947. The Robert Burns Cinema Film Club always finishes off the pre Christmas season with an appropriate festive film!!!! Last year you will remember it was The Muppet Christmas Carol (1992) with Sir Michael Caine and even I had to admit to enjoying a Christmas film! But this year we reverted to a typical painfully embarrassing and dated film that we are all supposed to love at this time of year, why are we meant to abandon our normal standards when viewing a film because of the season of the year? Perhaps some kind soul can let me know. Although Miracle on 34th Street (1947) is not really my cup of tea the evening was great fun beginning with a terrific introduction from Pat Pickering. Pat started by informing us that the film we were about to see had won 3 Oscars, Best Writing For Original Story, Best Screenplay and Best Supporting Actor for Edmund Gwenn who played Kris Kringle. The film also starred the red headed Maureen O’Hara, who I remembered from McLintock (1963), John Payne and the eight year old Natalie Wood in her first starring role. Pat admitted that the film was released at a time when people were happy to indulge themselves in such sentimental fair, World War 2 had only been over for a couple of years and a lot of people were still returning home. So this lighthearted, somewhat spiritually fantasized, movie with its happy ending was just what the public were looking for. Interestingly 20th Century-Fox studio head Darryl F Zanuck was very much against making the movie because he saw it as far to corny to succeed however he was persuaded by director George Seaton otherwise, but Zanuck still had doubts and played down the fact it was a Christmas film even shoving Santa Claus to the rear of the promotional poster and originally released it in May arguing that more people went to the cinema during the summer months. The Legion of Decency, an organization dedicated to identifying and combating objectionable content in motion pictures from the point of view of the Catholic Church in the United States, gave the film a ‘B’ rating which meant they deemed it morally objectionable in part, this was because Maureen O’Hara’s character was a divorcee and nothing to do with the fact that as a mother she was allowing her eight year old daughter to mix with men she did not know, which all seems jolly strange by todays standards! 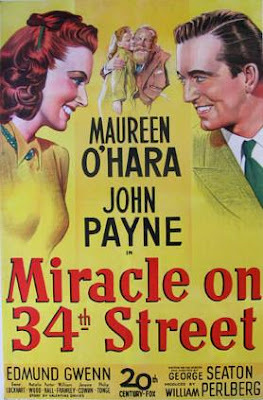 Our host went on to tell us that there had been three further versions of Miracle on 34th Street in 1959, 1973 and 1994 but the 1947 is considered to be the definitive version. Following the movie and a short break to enjoy some great mince pies we returned to the auditorium to discuss the film and hear some great trivia that Pat had researched which as I previously said made this a fun filled and light-hearted finish to this season of the film club. A special thanks to Pat for sharing her notes and to Fiona for Christmas treats.